At Pilch & Barnet, we love travel and we love marketing. But we also love being helpful. So this holiday season, we thought we’d provide you with a list of interesting holiday fun facts you can discuss at the dinner table, in lieu of politics, religion, climate change, or you know, anything else that could start a fistfight. A traditional Christmas dinner in Japan is Kentucky Fried Chicken? It is, of course, the result of a clever marketing campaign designed to promote the restaurant when it opened there in 1970. A Charlie Brown Christmas cost just $76,000 to produce back in 1965 (the modern day equivalent of $590K). Compare that to the 2015 Peanuts Movie which cost $99 MILLION. And if all else fails, bring in Alexa. The Amazon device can play Christmas music, recite “The Night Before Christmas” in its entirety, play Christmas sounds and give you even more fun holiday trivia to keep your gathering, above all else, civil. Thanksgiving is almost here. Let’s talk turkey. Did you know that the day before Turkey Day is actually nowhere near the busiest day for flying? It’s the 121st Find out the real busiest here. Good news if you’re driving this year. Gas, in some spots (including here in Madison, Wisconsin), is now under $2 a gallon. 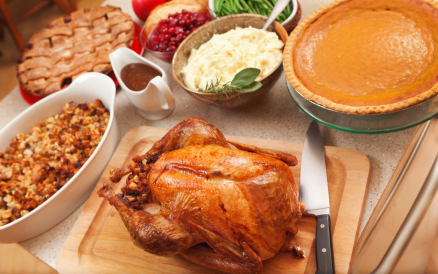 This year’s turkey dinner is expected to be more expensive than ever, thanks to the bird flu. But your costs will still pale in comparison to the $45,000 price tag for Thanksgiving dinner at The Old Homestead Steakhouse in New York City. Did we mention there’s a 2-carat diamond ring stuffed inside the bird? See the other extravagant goodies included. Ever wonder which is America’s favorite pie, on this, the holiday of overeating? Find the answer here. Huffington Post gave a suggestion on how to broach the subjects of elections, religion and refugees over dinner: don’t. Here instead are 27 things you can discuss instead (that are far less likely to bring your family to fisticuffs). If those topics won’t work, consider making one of these nasty Thanksgiving recipes (gravy pizza?! ), sure to become a conversation piece (in between the gagging, anyway). Ready or not, the holiday season is upon us. Are you heading over the river and through the woods this year? If so, you are not alone. Thanksgiving air travel is expected to jump by 3% this year, to over 25 million people. That’s the busiest in eight years. Prepare to fight for your airplane armrest. Part of the surge is due to lower airfares. Check out these tips to help you save even more. These travel hacks (complete with GIFs!) might help you your holiday travels go a little more smoothly. Don’t feel like heading home for the holidays? Check out this list of the top warm-weather and cold-weather destinations in the U.S., based on cost and fewest hassles. We are officially less than a week from Turkey Day 2014. Have your elastic-waist pants at the ready. AAA is predicting the most Thanksgiving travel in seven years. Maybe in part to those low gas prices we’re enjoying. If you’re one of those who’ll be hitting the road, Google can help (when can’t Google help?). Life hacks for holiday travel. You’re welcome. No one says you have to spend the holiday at home (yours or somebody else’s!). Why not turn that long weekend into a real vacation? No matter where you’re headed though, thanks to an early arrival by Old Man Winter, you’ve got a pretty darn good chance of seeing snow and an even better chance of needing your hat and mittens. Prepare your stomachs, Thanksgiving is less than two weeks away! We’re definitely drooling over the Thanksgiving links we found this week. Thanksgiving gives us an excuse to indulge on the full-flavor foods we love most – that’s something to be thankful for! Here are 30 delicious things to cook in November. And here are 50 Thanksgiving foods full of bacon. Because bacon. If cooking isn’t your forte and you’d rather dine out on Turkey Day, check out this list of great Thanksgiving restaurants. Finally, Martha Stewart’s “Everything Thanksgiving,” will help you with anything you need to prepare for Thanksgiving, including recipes, cooking techniques, decorating ideas and more.